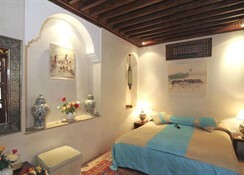 The stunning Riad Slitine is a hotel located on the former estate of a significant Marrakechi figure and consists of four riads built around five courtyards with flower beds and orange trees. 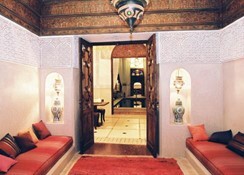 A haven offering peace and tranquillity, the riad is also ideally located within the historical and ancient medina area of the city, just a short distance from a number of the most popular attractions in the city including the Saadian Tombs, the Jemaa El Fna Square and the Koutoubia Mosque. The hotel boasts a lovely indoor swimming pool for guests to relax in, plus a large rooftop terrace ideal for soaking in the African sun by day and stargazing by night. Each of the guestrooms are lavishly decorated with stone walls and carved woodwork. Each has access to a patio area and comes equipped with minibar, private bathroom with hairdryer and other amenities usually associated with a hotel of this calibre. For dining there is a restaurant serving a range of local specialities to enjoy, plus a breakfast service is offered daily. There is also a bar lounge area for guests to enjoy their favourite drinks of an evening. Additional amenities include a 24-hour front desk, luggage storage, laundry, meeting facilities and photocopying. 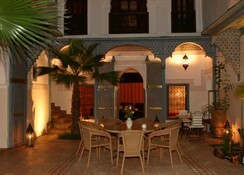 This Riad Slitine is a traditional hotel ideally suited to those seeking a luxurious and opulent stay right in the centre of the medina. There is a tranquil courtyard swimming pool for guests to enjoy, along with a rooftop terrace for guests to sunbathe on. 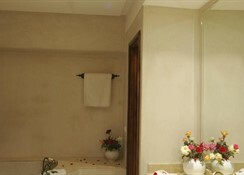 Each of the guestrooms are lavishly decorated with stone walls and carved woodwork. Each has access to a patio area and comes equipped with minibar, private bathroom with hairdryer and other amenities usually associated with a hotel of this calibre. Certain amenities may be payable locally. There is a restaurant serving a range of traditional Moroccan and international cuisine, plus there is a bar lounge area for those seeking their favourite drinks of an evening. 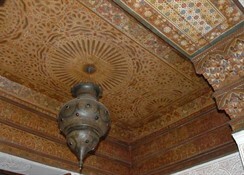 The riad is ideally located within the exotic city of Marrakech-a city split into the old town and the new town, this cultural metropolis boasts a number of cultural attractions and open-air markets filled with live entertainment. At night the city comes alive, offering exotic food, vibrant nightlife and a truly unique atmosphere.